I have Lulu to thank for inspiring me to prepare this snack. He was feeling a bit peckish, but there wasn’t a lot of food at home (the refrigerator is broken ). We had some brie leftover from my little munchkin’s birthday party, so he took a wedge of it and put it on a gingersnap cookie. Lulu was very proud of himself and offered me a bite. The mixture of sweet and salty flavors and soft and crunchy textures was very pleasant, and it instantly took me back in time to my childhood. When I came home from school, I used to make myself brie and banana “sandwiches” with baguette or just sliced bread. It was probably my favorite snack. Given that there were some very ripe bananas in the house along with the brie and gingersnaps, it seemed only fitting that I should share a little bite of my childhood with Lulu and my little munchkin. Of course, I’m not 7 anymore, so I decided to jazz it up a little. Caramelizing the bananas brought out additional flavors that really complemented the creaminess of the brie. 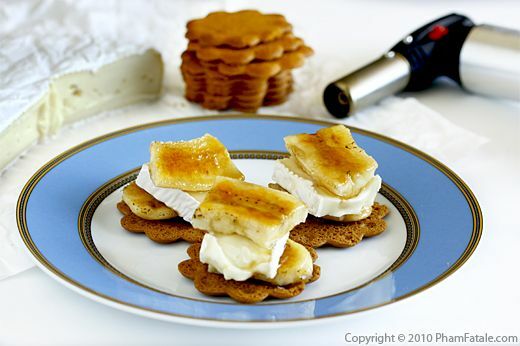 And instead of white bread I used gingersnap cookies as the delivery device for the banana brie combo (thanks Lulu!). I’ve often found myself disappointed when I try to relive the memories of my favorite childhood dishes. This, happily, was not one of those times! 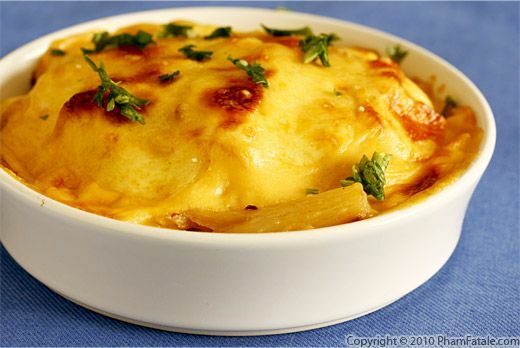 Gratin of salsify is a very common French winter dish. For my version, I added steamed fingerling potatoes and diced Granny Smith apples to make the flavors more interesting. The acidity of the apples and the starchiness of the potatoes give the salsify a great balance both in texture and taste. As you would any other gratin, the dish is covered them with béchamel sauce made with cheddar for a rich color. The crust is topped with Dubliner cheese. If you've never tried Dubliner cheese, you should. We've all become addicted to it. 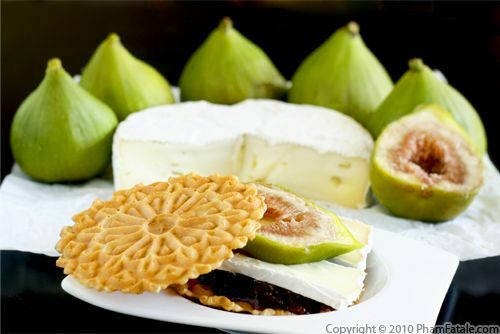 Its flavor is very similar to an aged gruyère, but with fruitier notes and a sharper bite. It's become one of my "go-to" cheeses for cooking. It takes this classic French version of comfort food to another level. 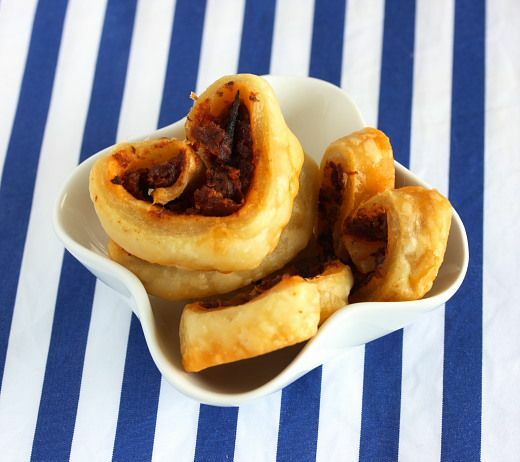 If you're planning on having a romantic meal on Valentine's Day, check out these adorable heart-shaped puff pastry appetizers. They're called palmiers. I've made a different version before with a traditional basil pesto, but today I decided to make them with sun-dried tomato pesto. Not only does it taste great, but the red color makes these little treats perfect for Valentine's Day. Even though palmiers look really fancy, they are ultra simple to make. If you're in a real hurry, you can even use store-bought pesto. Don't worry, I won't tell. 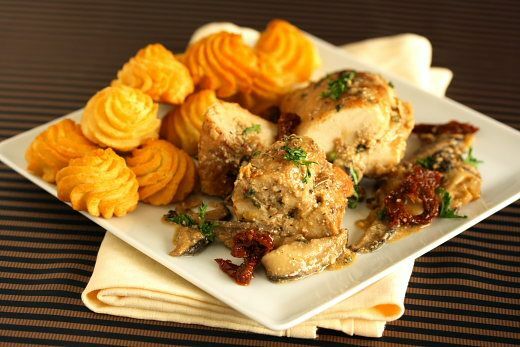 Mushroom and cheese stuffed chicken breast is a quick and easy chicken recipe for dinner. I used goat ricotta cheese, shiitake mushrooms, sun dried tomatoes and lemon to flavor the meat. Chicken breast can be dry, so I marinated the meat and cooked the chicken for only 15 minutes. It's perhaps more of a roll than a stuffing, but either way, it's delicious. My mother-in-law is an absolute creature of habit, and when we plan on cooking chicken, her preference is always poulet roti. Contrary to the stereotype, I love my mother-in-law dearly, so don't think I'm complaining, but it takes a miracle to get her to try new things. A couple of nights ago, we had some dinner guests and we had to come up with a main course. We had chicken breasts in the house, but no whole chicken. My mother-in-law was ready to go to the market to get a whole chicken, but I was able to convince her to give this recipe a try. Given the time crunch, she grudgingly gave in and let me prepare the dish. When she tasted it, she asked me why I haven't made it before! I see a lot of stuffed chicken breasts in my future, and if you try this recipe, I bet you will too! Page 4 of 11 pages.